At Let’s-Live Coaching we believe that anyone who has an undeniable passion and urge to help, uplift and assist other people can become an excellent Life Coach. Are convinced that they are called to make a difference in this world. Know deep in their heart that they are called to change things. Strife to bring a positive and lasting change into other people’s lives. No longer live for themselves, but strive to serve and empower other people’s lives. Want to be defiance makers, and coaches out of passion rather than for money. Know for sure that they are called to heal and bring life to this planet and its inhabitants. Are convinced that they are called to be reformers and that they are part of a greater purpose. Reflect rather than to direct. Develop rather than to impose. Withdraw from within rather than to install from outside. Be reactive and flexible and allow space for personal transition and personal development. Anyone can change in an instant. A good Life Coach never judges or criticizes people. What motivates people must be understood. Everyone is capable of achieving far beyond what they can imagine. A person’s past is no indication of their future, nor does it define them. People’s beliefs about what is possible for themselves are their only limits. Coaches don’t provide the answers, but rather assist their clients to draw the answers from within. All coaching is completely confidential, and know to always respect their client’s model of the world. From what background do Life Coaches come? At Let’s-Live Coaching we have learned to believe that Life Coaches come from various backgrounds and different walks of life. 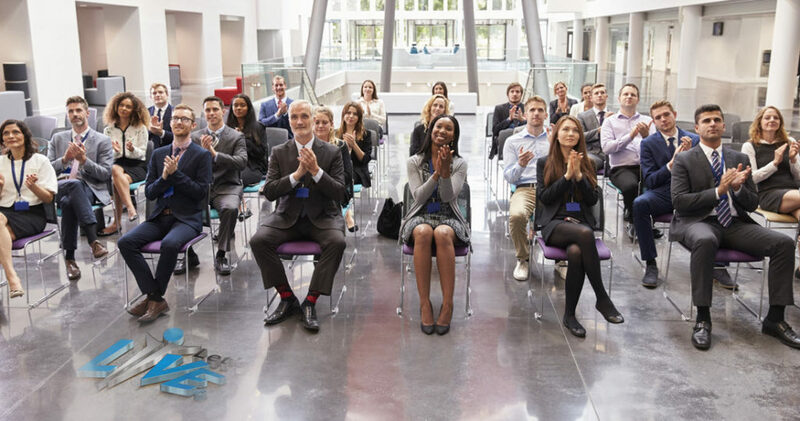 In the past few years, we were blessed and honoured with Life Coaching students from more than twenty different countries and nationalities who attended our advanced Life Coaching courses. Directors, Medical Doctors, Counsellors, Physiologist, Pastors, Missionaries, Teachers, Nursing, Management, Consulting, Prison Service, Therapy Counselling, Training Complementary Therapies, Human Resources, Personal Trainers, Voluntary workers, Charity workers, Armed forces, Emergency services, Service industries, HR, Engineers, Entrepreneurs, etc. Let’s-Live Coaching methodologies are unique and significantly different from Counselling, Traditional Psychology and or Traditional Pastoring. For us, Life Coaching is far more than just another skill development training. It goes beyond alternative methods and integrated techniques, theories and human behavioural concepts and traditional ideas. Let’s-Live Coaching principles and techniques are born from the knowledge and understanding of our original authentic blueprint and design. Our roots are firmly rooted in the knowledge of our Maker and we have an unshakable faith in people. The love for people and our Maker compels us to see each individual as complete and in lack of nothing. We use various Life Coaching techniques to assist people to easily and effortlessly tap into the streams of living water that flow from within. We use many different techniques to teach people how to strip themselves of any inferior opinion of themselves and rid themselves from a false identity, that kept them captive and withheld them from living the life of their dreams. Each one of the techniques that we teach is powerful enough in its own right to easily and effectively create lasting change in our client’s lives. We also firmly believe that each coaching session and or coaching technique should increase choice and ultimately allows freedom and magnificence from within. At Let’s-Live Coaching we believe that we exist to bring freedom to the people in this world. Our Life Coaches are committed to dedicating their lives to serve and enrich the lives of others. We find pleasure in fulfilling the dreams of other people and gladly assist where ever we can. Are the courses Nationally and Internationally Accredited? We are proud to be part of an illustrious network of highly reputable leaders in the Coaching and motivational fields and adhere to the codes of ethical conduct as set out by COMENSA – Coaches and Mentors of South Africa i.e. ITA – International Training Academy of NLP i.e. ICR – International Coaching Register i.e. 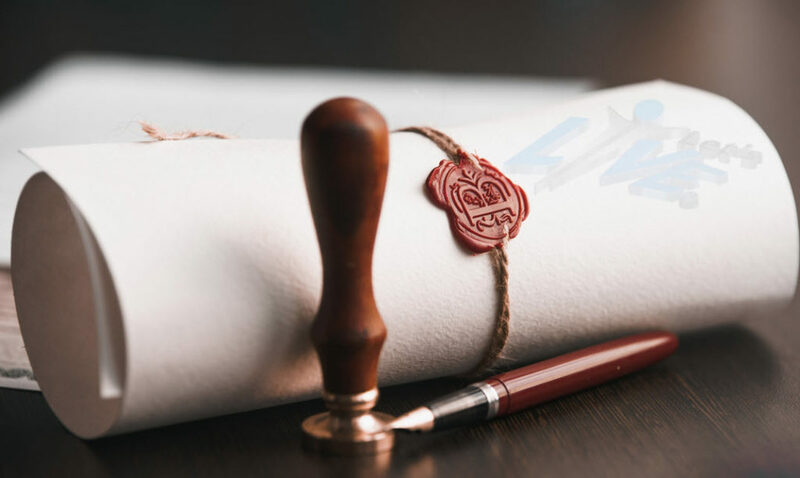 GSAC – Global Standards of NLP Accreditation’s and Certifications. How long are the courses and are they online or practical? 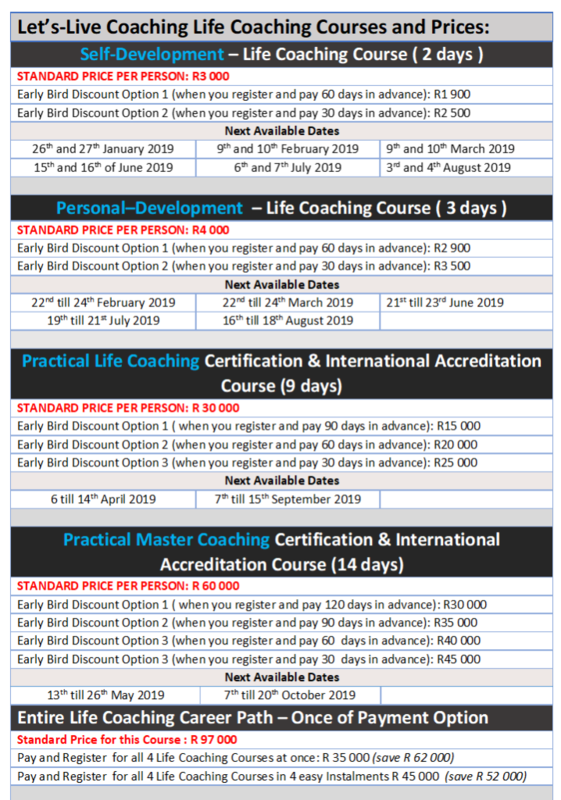 We offer various courses which are broken down into 6 modules, all students are required to attend all of these in order to become an Internationally Certified and Accredited Life Coach. Module 1: Attend the 2 Day Practical Self-Development Course. Module 2: Attend the 3 Day Practical Personal-Development Course. Module 3: Write your open book NLP and Life Coaching theoretical exams at home. Module 4: Attend the 9 Day Practical Life Coaching and NLP Training Course. Module 5: Write your open book Master NLP and Master Life Coaching Theoretical Exams. Module 6: Attend the 14 Day Master Coaching and Master NLP Practitioners Course. Download the more comprehensive PDF brochure. True freedom has to do with the human spirit - it is the freedom to be who we truly are.